Has Today’s Lifeline being a blessing to you? Then share your testimonies with us. Please note that the Editor reserves the right to publish any testimony from readers, in whole or in part as he deems fit in the public interest and to edit such for clarity or space. I read Today’s Lifeline with keen interest and for the first time in my life, a publication has touched every ramification of my life. Reading Today’s Lifeline was like a Pentecostal experience as described in Acts 2. I’m really blessed and rekindled. I don’t want to ever miss any of your publication. I have read Today’s Lifeline and I am blessed. The magazine touches every area of my life. I am really blessed by what I read in Today’s Lifeline. I fell for your magazine the very day I saw it; I almost couldn’t believe that Nigerians still had such Spirit of uniqueness and purpose, not just embedded but spilling out. I couldn’t drop the magazine when I picked it and since then I nursed the idea to become a distributor… I really want to say that both production and content won my virtual price for standards. 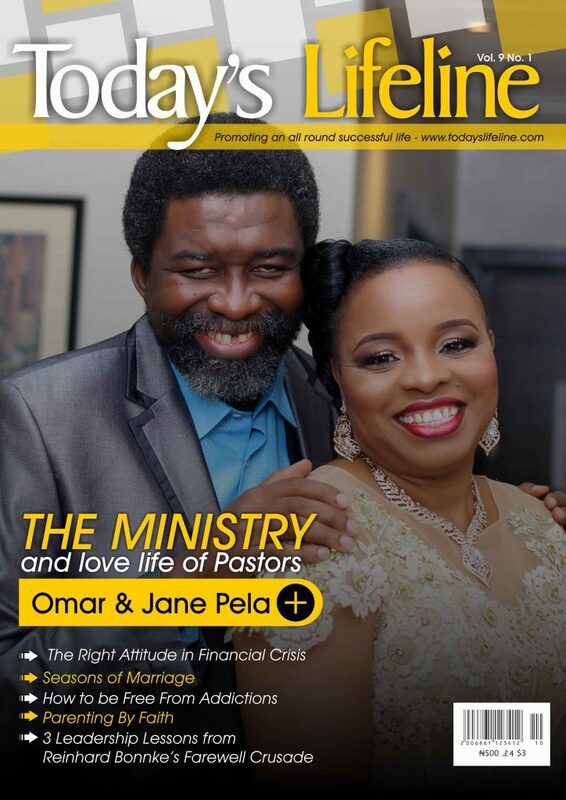 I give God the glory for the wonderful work done in putting up this magazine. It was a great blessing to my soul and a time of refreshing indeed. The combination of articles that made up Today’s Lifeline was so designed to address a wide variety of people. The youth, the single, the married, the aged, all formed part of the target audience. To wrap it up, this edition is wonderful, it bears the touch of excellence. My sincere prayer from my heart is that these articles reach the hungering souls; that it finds its way into the darkness in the hearts of men and shines the light of the gospel; that it locates men in danger awaiting deliverance; that it goes far into the prison house of darkness to liberate men. That truly it becomes a Lifeline- a succour in the time of trouble. Today’s Lifeline has been a blessing to me especially the interview with Dr. Ben Carson. You guys are too much! Thanks for Today’s Lifeline magazine. It is very rich in content and quality. You guys are really doing a great job and your reward is on the way. Please keep it up. I have read Today’s Lifeline. There is no doubt that it is very enriching. The content is superb and it can match any international publication; it is also a quality production. I am a Muslim and was interested in reading Today’s Lifeline. I was touched by what I read and realized I had made terrible mistakes in the past that has led to the separation between my wife and I for the past 18 years. Right now I am communicating with her for the first time after 18 years of neglect and I believe my marriage will work again. I love this magazine. I started with the 1st article, d introduction is spellbinding and the pages of the magazine are colourful. God bless you all! Today’s Lifeline has made a change in my family. So I recommend it for only those who would want to be themselves. Today’s Lifeline has a special way of impacting one’s life.